Haas, F. 1940. A tentative classification of the Palearctic unionids. Zoological Series of Field Museum of Natural History 24: 115-141. ‘Drouet’ Haas, 1940, Zool. Ser. Field Mus. Nat. Hist. : 137. Margarita (Unio) egyptiacus Jay, 1836. Lea, 1836, Synopsis Fam. Naiades: 29. Jay, 1836, Cat. Rec. Shells: 20. Lea, 1838, Synopsis Fam. Naiades: 21. Hanley, 1843, Illustr. Descr. Cat. Rec. Bivalve Shells: 198. Lea, 1852, Synopsis Fam. Naiades: 32. Conrad, 1853, Proc. Acad. Nat. Sci. : 267. Adams & Adams, 1857, Gen. Rec. Moll. : 494. Lea, 1870, Synopsis Fam. Naiades: 50. Haas, 1940, Zool. Ser. Field Mus. Nat. Hist. : 140 [as ‘Caelatura egyptiaca’]. Araujo et al., 2017, Zool. J. Linn. Soc. : 280. ‘Phillips’ Haas, 1940, Zool. Ser. Field Mus. Nat. Hist. : 120. Haas, 1940, Zool. Ser. Field Mus. Nat. Hist. : 119. ‘Drouët’ Haas, 1940, Zool. Ser. Field Mus. Nat. Hist. : 133. ‘Locard’ Haas, 1940, Zool. Ser. Field Mus. Nat. Hist. : 129. Simpson, 1900, Proc. U.S. Nat. Mus. : 695. Simpson, 1914, Descr. Cat. Naiades: 565. Haas, 1940, Zool. Ser. Field Mus. Nat. Hist. : 141. ‘Servain’ Haas, 1940, Zool. Ser. Field Mus. Nat. Hist. : 121. ‘Servain’ Haas, 1969, Das Tierreich: 23. Locard, 1893, Coqu. Eau Douce Saumâtre France: 186. Germain, 1931, Faune de France: 735. Haas, 1940, Zool. Ser. Field Mus. Nat. Hist. : 121. ‘Locard’ Haas, 1940, Zool. Ser. Field Mus. Nat. Hist. : 122. Kobelt, 1886, Icon. Land- und Süssw.-Moll. : 43. Westerlund, 1890, Fauna Paläarct. Binnenconch. : 153. Kobelt, 1893, Icon. Land- und Süssw.-Moll. : 87. Haas, 1940, Zool. Ser. Field Mus. Nat. Hist. : 131. Haas, 1969, Das Tierreich: 52. ‘Bourguignat’ Haas, 1940, Zool. Ser. Field Mus. Nat. Hist. : 121. Kobelt, 1884, Icon. Land- und Süssw.-Moll. : 65. Simpson, 1900, Proc. U.S. Nat. Mus. : 683. Simpson, 1914, Descr. Cat. Naiades: 533. Haas, 1940, Zool. Ser. Field Mus. Nat. Hist. : 127. Haas, 1969, Das Tierreich: 23. ‘Jordan’ Haas, 1940, Zool. Ser. Field Mus. Nat. Hist. : 121. Locard, 1882, Prodr. Malac. Franç. : 297. Locard, 1889, Contr. Faune Malacol. Franc. : 154 . Westerlund, 1890, Fauna Paläarct. Binnenconch. : 121. Locard, 1893, Coqu. Eau Douce Saumâtre France: 187. Germain, 1931, Faune de France: 739. Haas, 1940, Zool. Ser. Field Mus. Nat. Hist. : 123. Haas, 1969, Das Tierreich: 27. Fauna Europaea, 2012, Fauna Europa: [web]. ‘Drouët’ Kobelt, 1896, Icon. Land- und Süssw.-Moll. : 100. ‘Drouet’ Haas, 1940, Zool. Ser. Field Mus. Nat. Hist. : 125. ‘Monterosato’ Haas, 1940, Zool. Ser. Field Mus. Nat. Hist. : 127. ‘Clessin’ Haas, 1940, Zool. Ser. Field Mus. Nat. Hist. : 122. Locard, 1893, Coqu. Eau Douce Saumâtre France: 197. Germain, 1904, Bull. Soc. Sci. Nat. Ouest France: 275 . Germain, 1931, Faune de France: 737. Haas, 1940, Zool. Ser. Field Mus. Nat. Hist. : 126. ‘Locard’ Haas, 1940, Zool. Ser. Field Mus. Nat. Hist. : 131. Unio (cilicicus var.) berythensis Haas, 1940. ‘Kobelt & Rolle’ Haas, 1940, Zool. Ser. Field Mus. Nat. Hist. : 128. Haas, 1969, Das Tierreich: 42. Anodonta apollonica Bourguignat, 1880. — Haas (1940: 138). Anodonta cygnea (Linnaeus, 1758). — Haas (1940: 136). Anodonta taurica Bourguignat, 1880. — Haas (1940: 138). Anodonta vescoiana Bourguignat, 1856. — Haas (1940: 138). Caelatura [sic] egyptiaca [sic] (Cailliaud, 1827). — Haas (1940: 140). Diplodon parallelipipedon [sic] (Lea, 1834). — Haas (1940: 141). Elongaria orientalis (Lea, 1840). — Haas (1940: 141). Gabillotia pseudodopsis (Locard, 1883). — Haas (1940: 140). Lampsilis (Disconaias) discus (Lea, 1838). — Haas (1940: 141). Leguminaia saulcyi (Bourguignat, 1852). — Haas (1940: 133). Leguminaia wheatleyi (Lea, 1862). — Haas (1940: 133). Margaritifera auricularia auricularia (Spengler, 1793). — Haas (1940: 119). Margaritifera auricularia maroccana [sic] (Pallary, 1918). — Haas (1940: 119). Margaritifera margaritifera dahurica (Middendorff, 1850). — Haas (1940: 120). 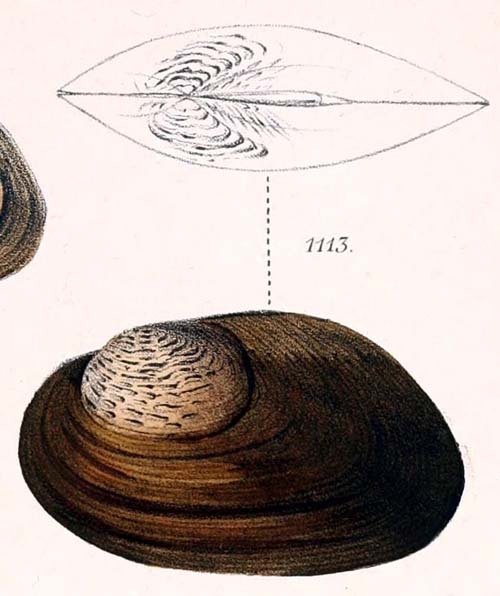 Margaritifera margaritifera laevis (Haas, 1910). — Haas (1940: 120). Margaritifera margaritifera margaritifera (Linnaeus, 1758). — Haas (1940: 120). Margaritifera margaritifera middendorffi (Rósen, 1926). — Haas (1940: 120). Microcondylaea compressa (Menke, 1830). — Haas (1940: 133). Pseudanodonta complanata (Rossmässler, 1835). — Haas (1940: 139). Pseudanodonta elongata (Holandre, 1836). — Haas (1940: 139). Pseudanodonta middendorffi compacta (Zelebor in Haidinger, 1851). — Haas (1940: 140). Pseudanodonta middendorffi middendorffi (Siemaschko, 1848). — Haas (1940: 140). Pseudodontopsis euphraticus (Bourguignat, 1852). — Haas (1940: 133). Psilunio acarnanicus (Kobelt, 1879). — Haas (1940: 134). Psilunio littoralis delesserti (Bourguignat, 1852). — Haas (1940: 135). Psilunio littoralis fellmanni (DeShayes, 1848). — Haas (1940: 135). Psilunio littoralis homsensis (Lea, 1864). — Haas (1940: 135). Psilunio littoralis komarowi (Boettger, O., 1880). — Haas (1940: 135). Psilunio littoralis littoralis (Lamarck, 1801). — Haas (1940: 134). Psilunio littoralis semirugatus (Lamarck, 1819). — Haas (1940: 135). Psilunio littoralis umbonatus (Rossmässler, 1844). — Haas (1940: 134). Unio abyssinicus von Martens, 1866. — Haas (1940: 124). Unio crassus batavus (Maton & Rackett, 1807). — Haas (1940: 130). Unio crassus bruguierianus Bourguignat, 1853. — Haas (1940: 132). Unio crassus carneus Küster, 1854. — Haas (1940: 131). Unio crassus crassus Retzius, 1788. — Haas (1940: 129). Unio crassus cytherea Küster, 1833. — Haas (1940: 129). Unio crassus gontieri Bourguignat, 1856. — Haas (1940: 131). Unio crassus jonicus [sic] Drouet, 1879. — Haas (1940: 131). Unio crassus mongolicus Middendorff, 1851. — Haas (1940: 132). Unio elongatulus aleroni Companyo & Massot, 1845. — Haas (1940: 126). Unio elongatulus bourgeticus Bourguignat in Locard, 1882. — Haas (1940: 125). Unio elongatulus decipiens Drouet, 1881. — Haas (1940: 125). Unio elongatulus dembeae Sowerby, 1865. — Haas (1940: 128). Unio elongatulus durieui DeShayes, 1847. — Haas (1940: 128). Unio elongatulus elongatulus Pfeiffer, C., 1825. — Haas (1940: 124). Unio elongatulus eucirrus Bourguignat, 1857. — Haas (1940: 128). Unio elongatulus fiscallianus Kleciach, 1872. — Haas (1940: 125). Unio elongatulus gargottae Philippi, 1836. — Haas (1940: 127). Unio elongatulus glaucinus Porro, 1838. — Haas (1940: 127). Unio elongatulus kruperi Drouet, 1879. — Haas (1940: 125). Unio elongatulus lawleyanus [sic] Gentiluomo, 1868. — Haas (1940: 127). Unio elongatulus mancus Lamarck, 1819. — Haas (1940: 126). Unio elongatulus moquinianus Dupuy, 1843. — Haas (1940: 126). Unio elongatulus pallens Rossmässler, 1842. — Haas (1940: 124). Unio elongatulus penchinatianus Bourguignat, 1865. — Haas (1940: 126). Unio elongatulus quelleneci [sic] Drouet, 1895. — Haas (1940: 125). Unio elongatulus requienii Michaud, 1831. — Haas (1940: 126). Unio elongatulus rousii Dupuy, 1849. — Haas (1940: 126). Unio elongatulus sandrii Rossmässler, 1844. — Haas (1940: 125). Unio elongatulus turtoni Payraudeau, 1826. — Haas (1940: 125). Unio elongatulus valentinus Rossmässler, 1854. — Haas (1940: 127). Unio pictorum ascanius Kobelt, 1913. — Haas (1940: 122). Unio pictorum delphinus Spengler, 1793. — Haas (1940: 123). Unio pictorum gaudioni Drouet, 1881. — Haas (1940: 122). Unio pictorum latirostris Küster, 1854. — Haas (1940: 121). Unio pictorum middendorffi Westerlund, 1890. — Haas (1940: 122). Unio pictorum moussonianus Clessin, 1887. — Haas (1940: 122). Unio pictorum mucidus Morelet, 1845. — Haas (1940: 123). Unio pictorum pictorum (Linnaeus, 1758). — Haas (1940: 121). Unio pictorum platyrhynchoideus [sic] Dupuy, 1849. — Haas (1940: 123). Unio pictorum platyrhynchus Rossmässler, 1835. — Haas (1940: 122). Unio pictorum praeposterus Küster, 1854. — Haas (1940: 121). Unio pictorum proëchistus Bourguignat, 1870. — Haas (1940: 122). Unio pictorum proëchus Bourguignat, 1862. — Haas (1940: 122). Unio pictorum ravoisieri DeShayes, 1848. — Haas (1940: 123). Unio pictorum rostratus Lamarck, 1819. — Haas (1940: 122). Unio pictorum schrenckianus [sic] Clessin, 1880. — Haas (1940: 122). Unio tigridis terminalis Bourguignat, 1852. — Haas (1940: 124). Unio tigridis tigridis Bourguignat, 1852. — Haas (1940: 123). Unio tumidus borysthenensis Kobelt, 1879. — Haas (1940: 129). Unio tumidus tumidus Retzius, 1788. — Haas (1940: 128).